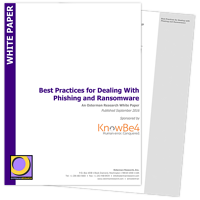 Check out these phishing whitepapers from KnowBe4 for industry best practices on how to implement security awareness training for your users and how to stop your organization from becoming a victim of cybercrime. New-school security awareness training and simulated phishing tests can be effective tools to strengthen your last line of defense: your users. However, if robust metrics are not put in place that help you understand human patterns, phishing tests can create organizational social engineering blind spots. Find out more about the breakthrough point in an organization's phishing awareness level. Phishing and ransomware are serious problems that can steal data or disable access to your organization’s network, both have devastating impacts on businesses of all sizes. 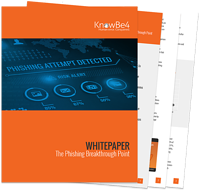 This whitepaper gives you a variety of best practices that you should follow to minimize your potential for becoming a victim of phishing and ransomware. CEO fraud is responsible for over $3 billion in losses. 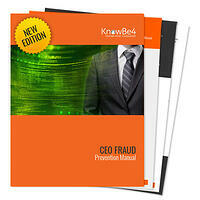 Don’t let this happen to you, get this CEO Fraud Prevention Manual now. Part I explains how top executives are compromised, how millions are siphoned off by criminals, and fiduciary responsibilities. Part II covers how to prevent such an attack as well as what to do if you become the latest victim. This includes checklists for response and prevention steps.